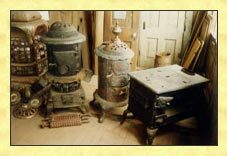 Period stoves purchased for the series. s the twenty-first century begins, the United States is a country that is unabashedly obsessed with food. Food -- both the pleasures and the perils of it -- surrounds us. We are constantly reminded to watch what we eat, to take in the correct amounts of vitamins and minerals, to eat plenty of fresh foods and vegetables, and to stay away from fat, salt, sugar ... the list goes on and on. Rather than watching their cholesterol and counting their calories, settlers on the 19th-century frontier were faced with a much more primary concern: making certain that they had anything to eat at all. Keeping hungry mouths fed on the frontier was a nonstop cycle of hunting and gathering, salting and smoking, canning and drying, scrimping and saving. 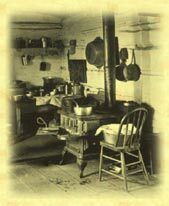 Though our mouths may water at the thought of daily servings of fresh-baked bread and homegrown vegetables, sickness, malnutrition, and starvation were very real possibilities for homesteaders. Finding and preparing food on the frontier was a ceaseless, daily task that took the majority of a settler's time. Cabin interior. Montana Historical Society. The bulk of homesteaders' diets were harvested from their claim or gathered from the wilderness that surrounded them. "Store-bought" items consisted of those few items which could not be grown, shot, picked, or made on the farm. Aside from being too pricey for any regular "grocery shopping" (as all goods had to be imported from "the East" or elsewhere), stores and shops on the frontier were a far cry from the popular image of the well-stocked, cozy "mercantile." Prior to the early 20th century, there were no laws governing tampering with food products; storekeepers on the frontier quickly discovered that it was profitable to "stretch" their inventories. 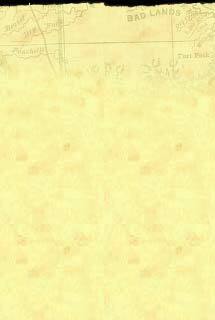 It was not uncommon for a pound of flour purchased in a general store to be half plaster. Cornmeal was "plumped" with sawdust. Coffee might contain dyed navy beans, dry-roasted peas, or even small pebbles. Luckily for the homesteaders, they often lived a prohibitive distance from the nearest store, and "trips to town" were few and far between. Jennie C. Forsythe, who settled in Sweet Grass County, Montana, in the 1880s, remembered that "The nearest trading point was Bozeman (that was also the nearest doctor). Father would make two trips a year and do all our trading at that time. If he didn't get something then, we did without it or made due with what we had." One basic food source for almost every frontier family was the vegetable garden, or "kitchen garden." Many families planted two gardens a year: one in the spring, which would supply greens, peas, and radishes, and one in the summer, which would provide heartier vegetables such as pumpkins, beans, potatoes, and squash. Settlers brought seeds with them to their new homes, bought them once they arrived on the frontier, or wrote to relatives "back East" asking for a hasty shipment. Creating bountiful gardens required constant vigilance against gophers, deer, bears, crows, and a host of other "invaders." A successful garden was critical to homesteaders' ability to feed themselves and their families; a single heavy storm or an unexpected frost could, in fact, destroy half a year's supplies. Though ice-boxes were available beginning in the 1830s, most settlers did not have regular access to ice. To chill foods such as butter, homesteaders placed them in earthen crocks in springs or wells. In addition to the fruits and vegetables grown in their gardens, settlers also quickly grew to recognize edible plants growing wild near their homes. In southern Montana, where the Frontier House participants settled, watercress grew wild along the rivers, and great thickets of chokecherries and huckleberries supplied homesteaders with fruit. Even berry-picking could be an adventure on the frontier, since berry patches were frequented by bears. Settlers quickly learned to pick in pairs, with one settler assigned to "lookout duty."